Home security systems are an inexpensive way of protecting your home and family. You can choose a wired or wireless security system. The benefits of wireless alarm systems is the fact that they can be placed almost anywhere. Wireless systems are quicker and easier to install without the hassle of drilling holes in your walls. Decide whether you want your system monitored by a professional security company. The costs for professional monitoring is inexpensive and may be the right choice for you. Another benefit to hiring an alarm monitoring company is the fact that your home will be monitored 24 hours a day. You can have sensors installed on your doors and windows that will trigger an alarm if compromised. Systems with on-site sirens and flashing lights will also get the attention of your neighbors. If you are not at home, your neighbors can quickly call the police. Home alarm systems will give you 30 to 50 seconds to disarm the alarm when you arrive at home. If the alarm is not disarmed, then a signal is sent to your alarm monitoring company. This signal can be a wireless transmission depending on the system you choose. The monitoring company will try to contact you and ask for your security code. If you don’t answer the phone or you can’t provide the security code, then law enforcement is contacted. Keep in mind that many cities now charge a fee for false alarms. There are several components to your home alarm system. The control panel is responsible for system operations. It is connected to the central monitoring system through a phone line or a wireless device. The central monitoring company is responsible for receiving alarm signals and communication between the homeowner and law enforcement. The touch pad is where you will find the buttons to arm or disarm the system. Some touch pads also have other emergency buttons such as fire and medical alerts. You can choose to install fire alarms in your home to protect you from smoke and fire damage. Motion detectors can also be installed within your system to provide better protection. These motion detecting sensors can be programmed to ignore a small family pet. Your professional monitoring company will help you choose the right motion detecting system for your home. Surveillance cameras are also available with wired or wireless capabilities. There are a variety of high-quality cameras that offer clear digital images. You can monitor your wireless security system from any device that has an Internet connection. This includes tablets, smartphones and computers located throughout the world. If you are traveling out of town, you can keep an eye out on your home. This can give you peace of mind while you are away. Consider installing a panic button with your security system. Panic buttons can be conveniently located throughout your home and used in split second emergencies. A panic button is often connected straight to the appropriate law enforcement agency. Before you choose an alarm company, research all the companies in your area. You may want to speak to your local law enforcement office first to get an idea about response times. Some areas response times are fast, but rural areas may experience longer response times. If you live in a rural area or your response times are not very good, you may want to further protect your valuables by installing a well-hidden safe or store these items in a safe deposit box at the bank. Avoid signing a long term agreement with an alarm company in case you are not happy with their service. Try to get several quotes from different companies before you choose one. Compare installation services and costs. Look for promotions that offer free installation and other discounts. According to recent FBI statistics, a home intrusion occurs every 15 seconds. This results in annual losses of over $4 billion. You should develop a home security system that reduces your risk of home intrusion. There are several ways you can reduce your risk such as keeping valuables out of sight. Do not leave your curtains or blinds open so people who pass by can see inside your home. Valuable electronics, jewelry and cash are common targets that entice an intruder. You can reduce your risk of home burglary when you are on vacation by limiting the amount of people you tell. You can also install automatic timers to make your home look lived in while you are gone. Change the locks when you move into a new home. Make sure your entry doors are made out of solid wood or steel. Flimsy entry doors are easy to break into and preferred by your average burglar. Install high-quality locks on all entry doors and windows. A burglar is looking for a fast way inside your home. Everything you do to slow them down reduces your risk of theft. Sliding patio doors can be secured by installing a pin lock. You can find these types of patio door locks at your local home improvement store. Getting to know your neighbors is a great way to make new friends and improve your home security. Neighborhood crime watches are a popular way to deter crime. If there is no neighborhood crime watch organization in your neighborhood, you can start one. Contact local law enforcement to learn what you can do to get the community involved in reducing crime. Many law enforcement agencies will hold crime watch meetings when requested. Be familiar with your neighborhood and report suspicious vehicles or persons. If you live in an apartment or condo, you can still establish a crime watch team. Contact your management company to see what you can do to improve security in your neighborhood. The management company should make sure all lights in the community parking areas and walkways are in good working order. Dark areas at night can increase the security risks to vehicles and residents. 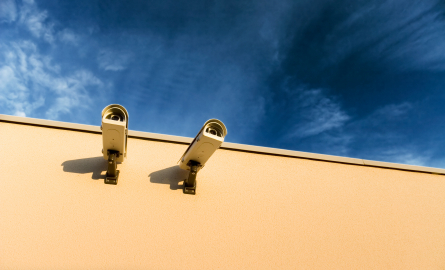 Combine a good home alarm system with other security measures to reduce your security risks. Contact us today to know more about TechPro Security’s products.